April Showers (or snow) brings May Flowers.......... well, we have definitely gotten our fair share of snow since the first day of Spring. I am ready for some warmer weather because I am so tired of just being cold! However, snow days and cold days are a great excuse to stay inside and sew, sew, sew! Have you been working on your UFO projects? I've done quite a few new projects this winter, but March has been so busy for us that I am beginning to miss my sewing machine! Time for me to get back at it. We've made a few changes in our classroom this month. I can't wait for you to see it! Thanks to the generosity of Elisabeth and Barb, we now have a Design Wall in our classroom! It was such a surprise gift from them and so greatly appreciated. This will be a fabulous tool for our teachers and for our sewers. 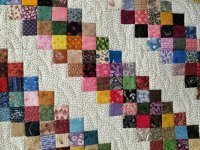 It is so handy to be able to hang your blocks up and check out your layout of a new quilt! Thank you Elisabeth and Barb!!!! Thank you to all who visited Hoppin Bobbin during our Quilts Around the Bay Shop Hop! It was so great to see everyone and I hope you had as much fun as we did! March was busy for us with the Shop Hop and the Lancaster Show. I think all of us are trying to recuperate! There are lots of fun and exciting things coming up the next few months! New fabrics, New patterns and a bushel of fun! Hope you join us! Do you pick up the Country Register? If you haven't in the past, be sure to pick up the March/April issue and follow along with our Mystery Quilt pattern that will be featured in that edition! 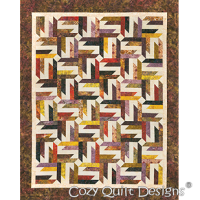 This great lap size quilt is a fun, fast and easy quilt. 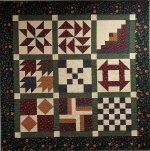 The March / April issue will give you yardage requirements and instructions to make the first components of the quilt. 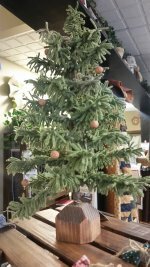 We can help with color selection (especially since we know what the finished project looks like!) May/June issue will feature the next step in the process and the July/August issue will have the finishing touches! The From Marti and Me Club is perfect for an advanced beginner or a refresher for the quilter that wants to brush up or advance their skills. Join this great club as a way to expand all of your quilting skills. Learn ways to make that perfect block or project using Marti Michell's patterns and tools during a monthly demo that includes an exclusive pattern. The engineered corners on her tools take all of the guessing out of piecing and make cutting and sewing your projects easy and fun. 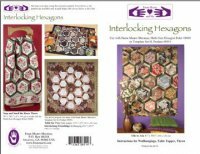 Projects range from table toppers and wall hangings to full size quilts and most patterns offer multiple sizes to make the one that suits your needs. Club fee is $30.00/6 months. There are still spaces left in each of the classes, be sure to sign up today! We will not meet on Thursday April 26th, but will reschedule this date in May. You must contact the Guild to participate in this workshop as you can not register through Hoppin Bobbin. Hoppin Bobbin has the patterns and rulers for this project. Elisabeth is back with her Strippin Club Night! great night of food, fun and learning! This months project is Spangled, see the sample in the classroom at Hoppin Bobbin! Kits with pre cut strips are available for this class. 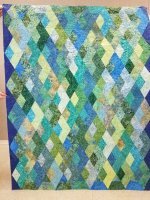 Sharon is a Studio 180 Certified instructor and is excited about teaching you this fabulous Lemoyne star quilt! Whirling Lemoynes creates a spinning effect that was inspired by those fun whirling flower lawn ornaments. 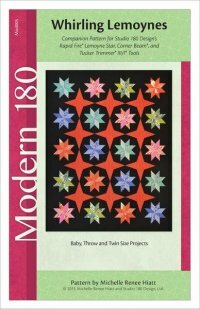 It's a whimsical quilt that teaches you how to piece Lemoynes and 4-pointed stars without paper piecing. You can go scrappy, or use fat eighths, eighth yard cuts, or a Jelly Roll for your Lemoyne Star points. Come and join us for a fun day/evening of sewing on the Mystery Quilt published in the Country Register! Bring a dish to share and come and join us anytime during the day or evening to work on Part 1 of our Mystery Quilt.